It is time for another edition of Fab Fast Friday! Fab Fast Friday is my "quickie" review series where I basically just let you guys know what I am using and loving lately. :) It is my way to give you the skinny scoop on some really awesome products! 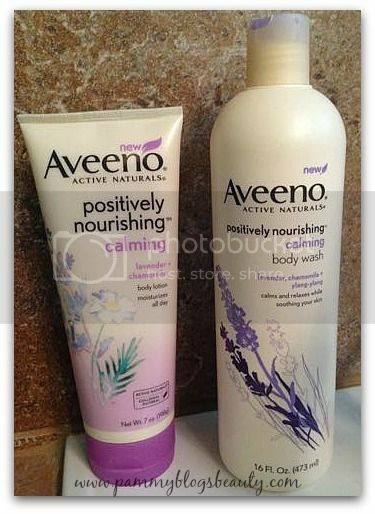 This week I am going to share with you a couple of my favorite shower and post-shower items: Aveeno's Positively Nourising Calming Body Wash & Body Lotion. As an Aveeno Ambassador, I am having such a great time exploring this brand! I feel like Aveeno is a great fit for my skin type: I have very sensitive skin...and these products are just so gentle and soothing! I honestly have yet to meet an Aveeno product that has not worked for my skin. Aveeno's Positively Nourishing Calming Body Wash and Body Lotion is formulated with Lavender and Chamomile. If you are not a fan of lavender, don't let that scare you off. These products do not have a typical lavender smell. These Positively Nourishing Calming formula products actually have quite a lovely and fresh soft fragrance (I think there is a hint of lavender...but, mostly it just smells "clean" to me). I like using the Aveeno Positively Nourishing Calming Body Wash on a body pouf in the shower. It cleanses my skin gently without over-drying or leaving my skin feeling stripped. My skin is just left feeling clean and soft. It works into a nice lather and rinses clean. My husband tends to use my shower products and has mentioned that he is a fan of this Body Wash, too! After my shower, I towel dry and then apply Aveeno's Positively Nourishing Calming Body Lotion. I apply this pretty much from the neck down: my arms, legs, torso, feet, etc! The scent certainly is soothing! The Body Lotion is thick and rich without being sticky or greasy. I massage it into my skin and it quickly absorbs. Have you tried this formula of Aveeno's Positively Nourishing products? What did you think? Even though I tried the "calming" formula, I must note that these are not just products for evening showers! I actually use them in the morning after my morning shower. There is also an "Energizing" formulation that I would love to try next (grapefruit and pomegranate). Has anyone tried that? How do you like it?